Most of the girls like wearing bright and colorful clothing during summer season. This classic T-shirt of zigzag design is adorable among young ladies. It is made from soft lightweight cotton of high quality. Its red, orange and yellow colors attract the view of many people. It can be worn with a pair of nice shorts or denim trousers. These shorts can serve as good additional clothing in a wardrobe of each young girl. Every look of a girl must be matched by an impressing accessory. For example, this nice head band by Billieblush is a good choice to make the girl’s appearance more attractive and remarkable. It is embroidered with a big striped bow of pale yellow color. It will look perfect with a vivid summer dress or a lovely denim overall. Dresses are the most favorite item of girls during summer time. Billieblush offers a cute white knitted dress with a pretty zigzag pattern of pastel colors, such as blue, pink and peach. It is made of high quality cotton, which will provide the girl with comfort during summer activities. Some stylish accessories will definitely add chic to the whole look. it is definitely one of the must-haves this summer. Only skirt can make such a delicate and feminine look of girl during summer season. Sonia Rykiel Enfant offers young ladies a cure cotton skirt of pale gray color. It is embroidered with strips of bright pink, red, yellow and green colors. A perfect look will be achieved with the combination of such a skirt with a plain cotton T-shirt. The most popular summer activity among kids is swimming. That is the reason to choose a fashionable swimming suit of Kenzo. This one is white with bright red stripes on in. a lovely fish print of pastel colors is placed on the front of it. A cute ruffle skirt seems very gentle. The back of the swimwear is represented by crossover straps. 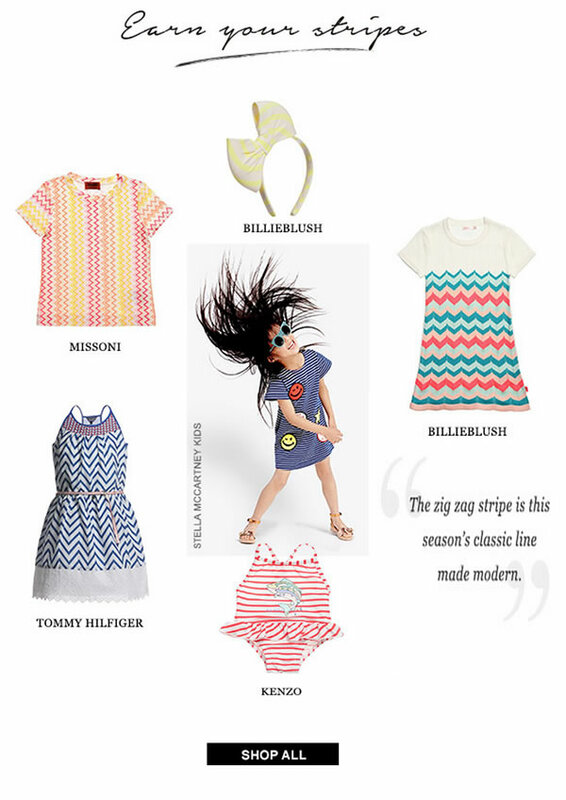 Tommy Hilfiger continues impressing young stylish girls with his remarkable summer clothing. This dress with straps of high quality light cotton is the most adored in the last collection. The dress has a zigzag pattern all over it. An elegant broderie anglaise hem makes the look of a dress more delicate and feminine. Special red embroidery on the top looks brisk. A thin cotton belt of white and red colors is placed on the waist.